Photo by Nick KrugLawrence artist Darin M. White is pictured on Thursday, April 3, 2012 in his home. White recently returned from Brooklyn, New York, where he showed a series of his work. “Appropriate Attire: Burlap and Earth,” transfer print on reclaimed copper, by Darin White. “Bear Heart,” a reclaimed taxidermy black bear, and site specific sculpture installation, by Darin White. The life of an artist is more than brooding over how to make a piece just right. It also involves raising money to create projects or travel to exhibitions. And that’s what has Lawrence artist Darin White stressing out these days. Lawrence artist Darin White’s “Overflow” involves a makeshift barn overflowing with corn. He has just over 24 hours left to raise $5,000 to fund a trip to New York to show the exhibit. Originally published April 6, 2012 at 11:47 a.m., updated April 6, 2012 at 1:59 p.m. Guest curator of the exhibition is Darin M. White. White is an artist and independent curator based in Lawrence, Kansas. With his wife Shannon, a painter and arts advocate, they founded b.a.l.m. (beauty, art & life movement). Together they promote creativity and action, and encouraging others in their art and understanding. White continues to expand his artistic medium including: sculpture, installation, printmaking, drawing, producing/ curating/ jurying exhibitions and writing art reviews and articles. His love and awe of life and people are intertwined and explored in these various avenues. John Hachmeister, The Great Consumer, Rust on tyvec, h 42″ x w 61″. Rex Hausmann working on his painting for the Dannin Project at the Lawrence Arts Center. San Antonio-based artist Rex Hausmann made a corner of the Lawrence Arts Center, 940 N.H., into his personal studio this past week, creating a painting in public view. And on Friday he’ll turn that space over to Lawrence-area artists to respond in their own way. Matthew Farley, Jane Flanders, John Hachmeister, Elden Tefft, Maria Velasco,Baruch Vergara, and Shannon White. curated by Darin White and sponsored by b.a.l.m. 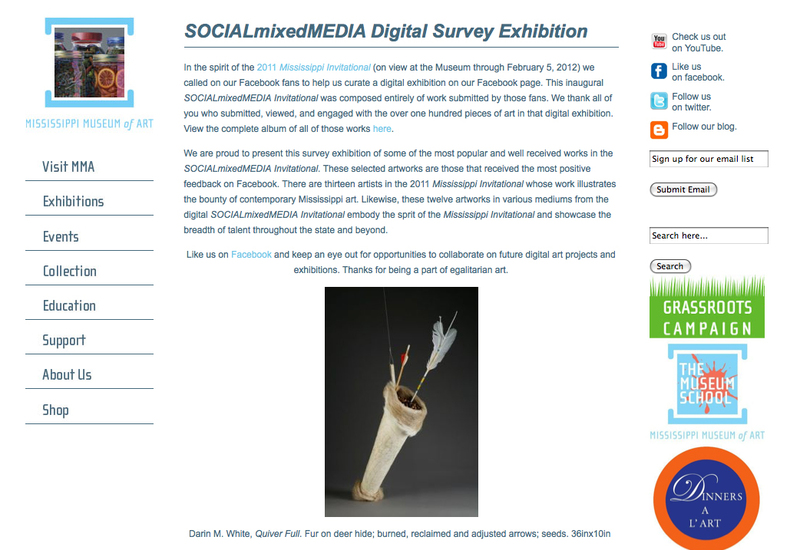 In the spirit of the 2011 Mississippi Invitational (on view at the Museum through February 5, 2012) we called on our Facebook fans to help us curate a digital exhibition on our Facebook page. This inaugural SOCIALmixedMEDIA Invitational was composed entirely of work submitted by those fans. We thank all of you who submitted, viewed, and engaged with the over one hundred pieces of art in that digital exhibition. View the complete album of all of those works here. We are proud to present this survey exhibition of some of the most popular and well received works in the SOCIALmixedMEDIA Invitational. These selected artworks are those that received the most positive feedback on Facebook. There are thirteen artists in the 2011 Mississippi Invitational whose work illustrates the bounty of contemporary Mississippi art. Likewise, these twelve artworks in various mediums from the digital SOCIALmixedMEDIA Invitational embody the spirit of the Mississippi Invitational and showcase the breadth of talent throughout the state and beyond. Feature artist in Bread & Glitter Journal. Metro Arts Alliance and Des Moines Social Club take the post-Mardi Gras theme more literally with “Sweeping Up the Mess” opening this Friday at White Carpet Gallery at Hillyard (4267 109th St., Urbandale). That juried exhibition of painting, sculpture, poetry and other art forms requires the use of custodial supplies and highlights Iowa’s refugee community. Rex Haussmann, Deb Seeger, Jennifer Rivera, Jason Barr, Katherine O’hara and Yarn Dawgz will exhibit. Nick Krug/Journal-World Photo. Rex Hausman, left, San Antonio, and Darin White of Lawrence, work to assemble a display of soup cans featuring latin american foods in the lobby of the Lawrence Arts Center on Monday, April 25, 2011. The cans, which are glue drums painted by San Antonio artist Avi Avalos, are a playful take on pop artist Andy Warhol’s Campbell’s Soup cans and were designed to promote an art show featuring the work of over 30 San Antonio artists, The New Old San Antonio: Tales from the Little Big Town, which opens Friday at the Art Center in conjunction with Final Fridays. by Darin White and links to Shannon White’s recent show. art collective. Now, isn’t that a gas? collectives including b.a.l.m. Darin M. White was part of producing this collective work. An article in Lawrence Magazine about art collectives in Lawrence including b.a.l.m. Curated by Darin M. White. Darin was also was part of the collective work. Darin M. White worked on the collective art. Curated by Darin M. White for Final Friday’s at 739 Mass. Flash Space in Lawrence, KS. Clara Houk, 2, Lawrence, peeks out from inside of artist Lori Bury’s sculpture named Telescope (Dreamscape). Darin M. White was included in this exhibition. Event announcement of b.a.l.m. WHITE SHOW in conjunction with San Antonio, TX Contemporary Art Month (CAM). A show that Darin M. White was involved with.